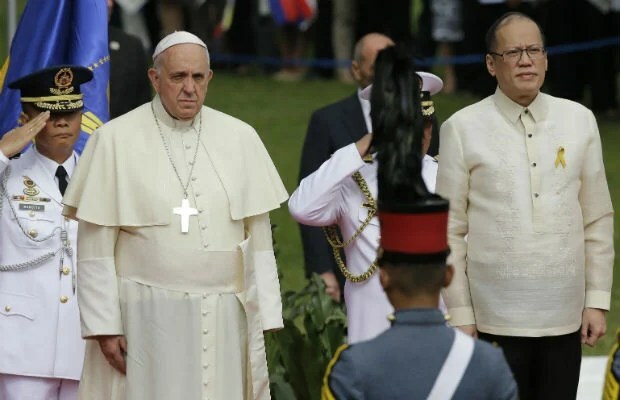 President Aquino’s speech on the occasion of Pope Francis’ visit to Malacanang was criticized by many for being inappropriate and petty. While the Pope talked about rejecting corruption, confronting inequality and social exclusion and giving voice to the poor, the President whined about how some members of the Catholic Church continue to criticize him. He even took time to mention one bishop who criticized his hair. The two speeches were worlds apart and again highlighted how self-absorbed the President is. The occasion could have been an opportunity for the President to show humility in the face of the message of the Pope; that much still needs to be done in the Philippines to address poverty and inequality. It could have been an occasion to discuss the need to address the root causes of armed conflict and push the resumption of the peace talks with the NDFP. Aquino could have taken the high road and announced the release of political prisoners as part of the peace initiative and as a goodwill gesture to the Pope. The speech of course does not come as a surprise anymore because it follows the Palace template for presidential speeches. This template has been duly approved by the President, so those wanting to fire last Friday’s speech writers are barking up the wrong tree. As I posted earlier, there are 4 key elements in any Aquino speech. The first element is recalling memories of Martial Law, Aquino’s parents and how much his family suffered, and use this as a force field against any criticism of his presidency. You simply cannot criticize one who has gone through so much difficulty during the dictatorship. You just can’t. These teachings have been central to my family’s advocacy, which is understandable considering what we, along with millions of Filipinos, went through under the dictatorship. Then-President Marcos declared Martial Law in 1972, when I was 12-years-old, beginning an era in which the most fundamental rights of many Filipinos were flagrantly and routinely violated. It was in this environment that I came of age. The second element is of course referencing the “previous administration” ad nauseam, even though he’s already five years into his term. What better way to stand out than to constantly compare yourself to the disgraced Arroyo government every opportunity you get. This is also to remind critics that, despite pork barrel corruption, failed Yolanda relief and rehab, record joblessness and continuing rights abuses; we are still sooo much better off now than we were 5 years ago. The third element of an Aquino speech is hitting back at critics, no matter what the occasion, no matter how inappropriate. Since some critics refuse to be swayed by references to Martial Law and the Arroyo regime, the President will thus have to reserve his sharpest remarks for them. We’ve seen this many times, during Aquino’s speech at the TV Patrol anniversary where he took a swipe at Noli de Castro; at the anniversary of Yolanda where he criticized victims groups People Surge and the Tacloban Mayor, and during an IBP event where he slammed the Supreme Court and Chief Justice Renato Corona who was also present at the event. In contrast to their previous silence, some members of the clergy now seem to think that the way to be true to the faith means finding something to criticize, even to the extent that one prelate admonished me to do something about my hair, as if it were a mortal sin. Is it any wonder then, that they see the glass not as half-full, or half-empty, but almost totally empty. Judgment is rendered without an appreciation of the facts. The fourth element of an Aquino speech is actually a direct reference to the President. Words like, “I”, “Me” and “Myself” become very useful. This seeks to underscore how awesome the President is. And so during the event in Malacanang, in classic Kris Aquino fashion, the President talked about himself, amid other more pressing issues. I understand I am only human, and thus, I am imperfect. I ran for the Presidency despite my discomfort with the trappings of power, because if I passed up on this opportunity to effect real change, I would not have been able to live with myself, especially if the situation worsened. Everything I have said has not been to criticize, but to speak the truth, for the truth shall set us all free. We would like to think that even more will join us in the truth, in the fullness of time. Because if you’re not joining the president “in the truth”, you’re screwed. You’re either with him or against him. Such was the experience yesterday of more than 2,000 workers, farmers and urban poor who were prevented by police from welcoming the Pope, just as the Pope was calling on Philippine leaders to give voice to the poor. Same goes for the Mindanao nuns who were accosted by police on their way to Tacloban on suspicion that they were members of the NPA. Indeed, the President’s speech and the message of Pope Francis provided us with a study in contrast. As one religious said, there is truly a difference in the outlook of a religious leader and a politician. Pope Francis’ message to the poor, his heartfelt speech to the victims of Yolanda/Haiyan and his critique of corruption and inequality, continue to resonate with the Filipino people. His challenge to the clergy to place the Poor at the center of the Gospel, to be with the poor to be able to understand the poor, is a most welcome exhortation towards social involvement. His call to “break the bonds of injustice and oppression” is nothing short of revolutionary. We tip our hats to the Pope of the Poor even as we humbly ask forgiveness for the actions of our President.